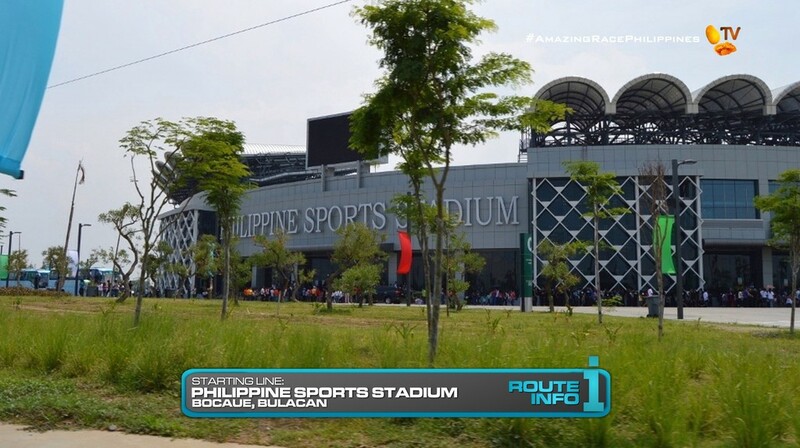 Next to the largest domed arena in the world is the Starting Line for twelve All-Star teams from The Amazing Race Philippines; the field of the Philippine Sports Stadium in Bocaue, Bulacan. Twelve All-Star teams from The Amazing Race Philippines begin the Race by running to the clues on top of their backpacks provided by Rexona. That clue gives teams directions on how to find tickets to one of two flights to their first destination: Guangzhou, China. There are spots for six teams on each flight. Flight 1 on China Southern departs at 5:35pm and arrives at 8:15pm while Flight 2 on Cebu Pacific departs at 7:05pm and arrives at 8:30pm. The tickets are scattered at four different locations in the stands of the stadium. Teams will need to figure out one of four riddles/clues which will point them to the section, row and seat number where the tickets will be waiting for them. 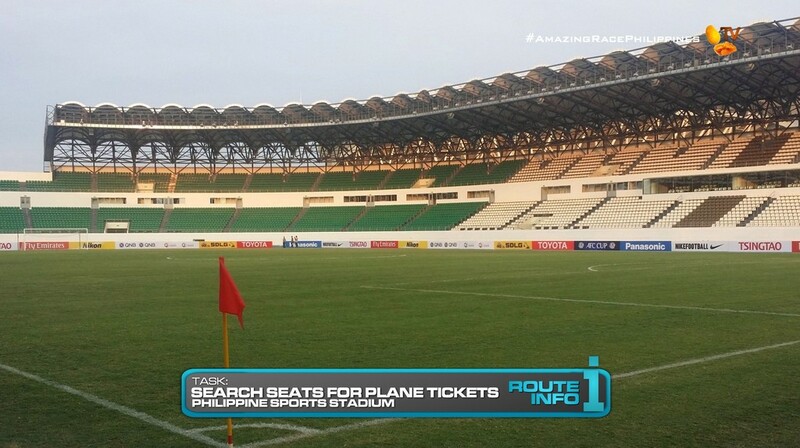 Once teams have found their tickets, they can run out to the waiting taxis to take them to Manila International Airport. 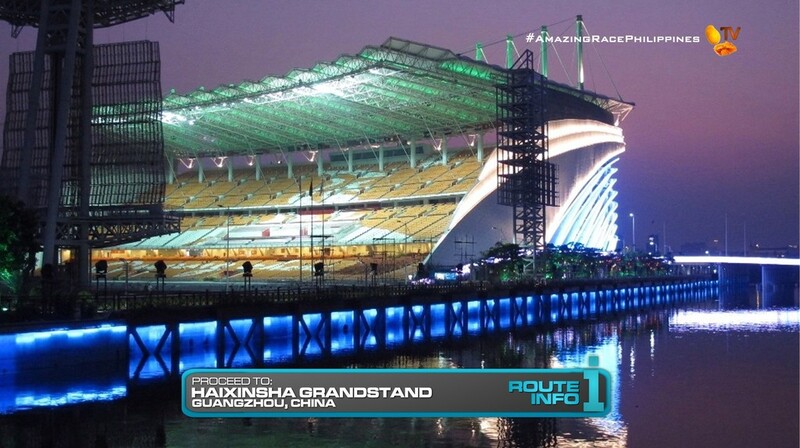 Upon arrival in Guangzhou, teams must make their way to Haixinsha Grandstand, the site of the 2010 Asian Games Opening Ceremony. 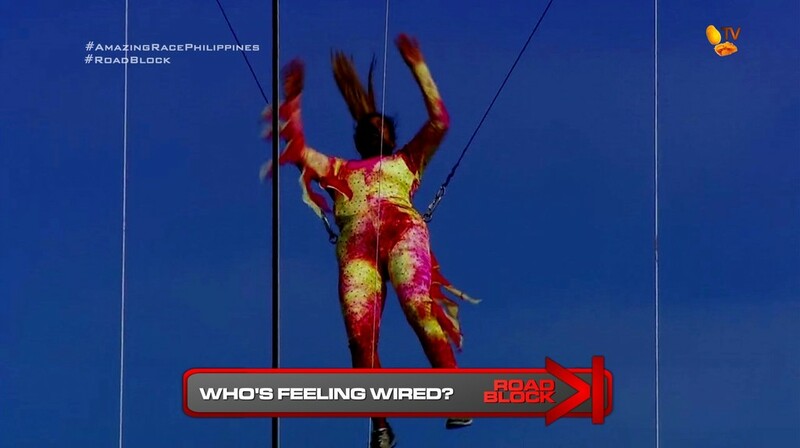 Here, they will find the very first Road Block of the Race: Who’s feeling wired? For this Road Block, teams will dress in a special costume to perform five aerial somersaults while suspended 300 feet in the air by wires attached to the grandstand’s towers. Once they have properly completed five flips within a set time limit, they will receive their next clue. 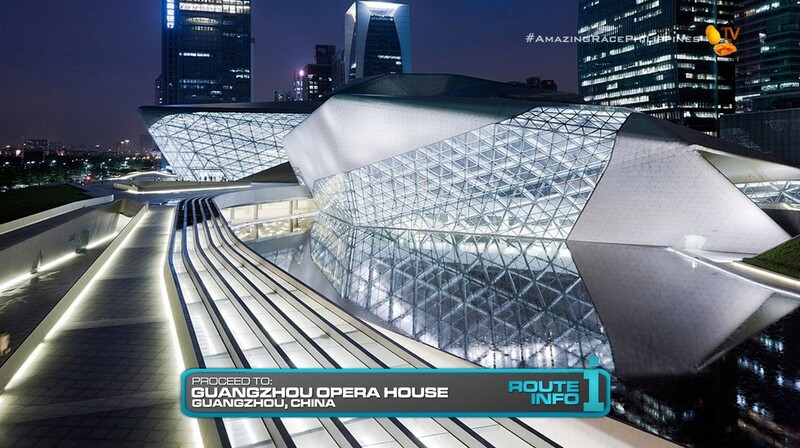 That clue directs teams to make their way on foot to the Guangzhou Opera House. Here, teams will find a Roundabout. 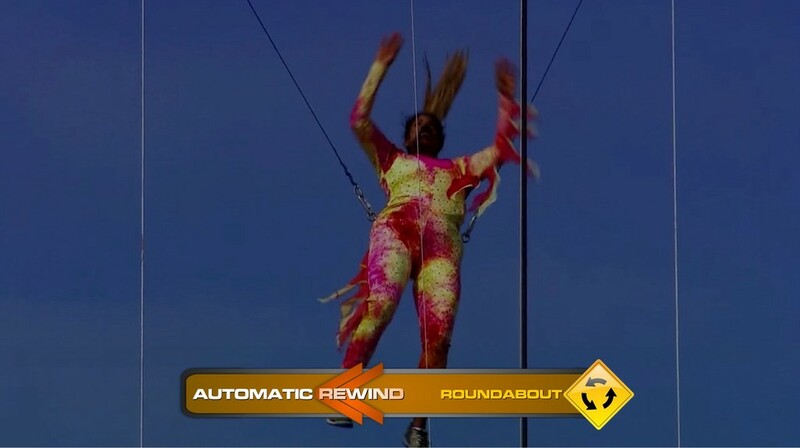 For this Roundabout, teams will have the opportunity to gain two powers that can help them on the Race. On the first turnoff, two teams can win an Express Pass by giving themselves a Rewind to repeat the Road Block. On the second turnoff, two teams can attempt to win a Super Yield. A Super Yield allows a team to Yield all teams behind them at a certain point in a Leg. 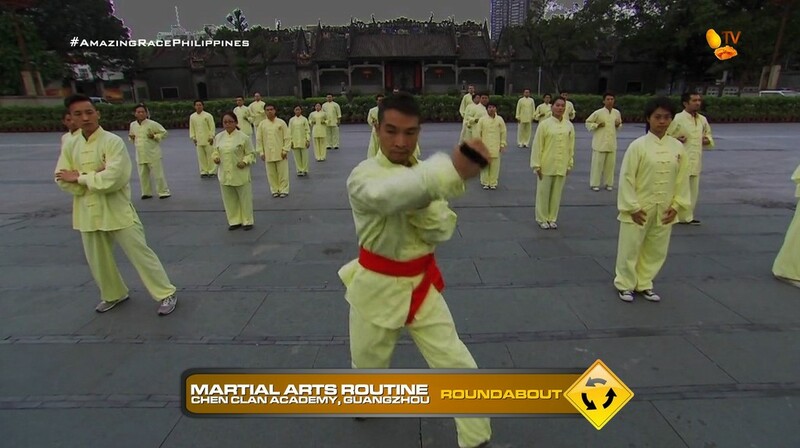 To win the Super Yield, teams will need to take a taxi to Chen Clan Academy where they must learn a martial arts routine and correctly perform it. 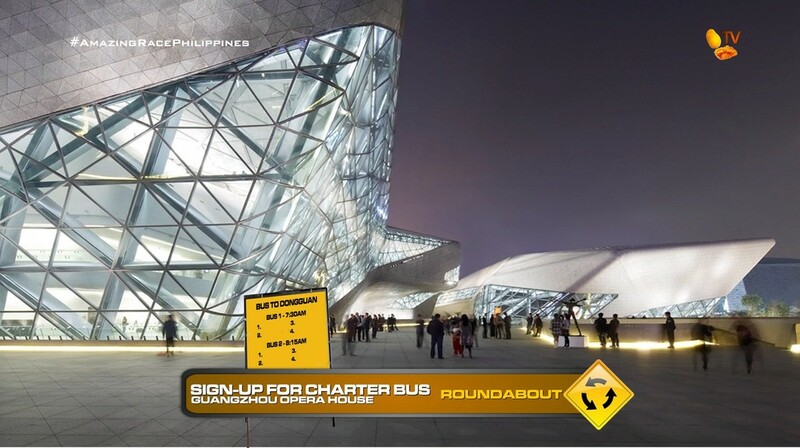 If teams decide not to go for either award or have completed one of the first two turnoffs, teams can take the last turnoff where they must sign up for one of three charter buses that will depart for Dongguan, China. Teams cannot attempt the first two turnoffs if they have already signed up for a charter bus. There will be four teams on each charter bus, departing the next morning at 7:30am, 8:15am and 8:45am. 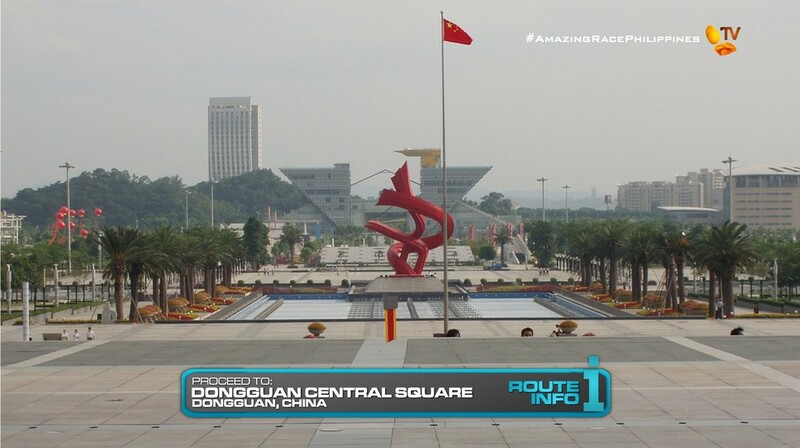 The charter buses will take teams directly to Dongguan Central Square where they will find their next clue. 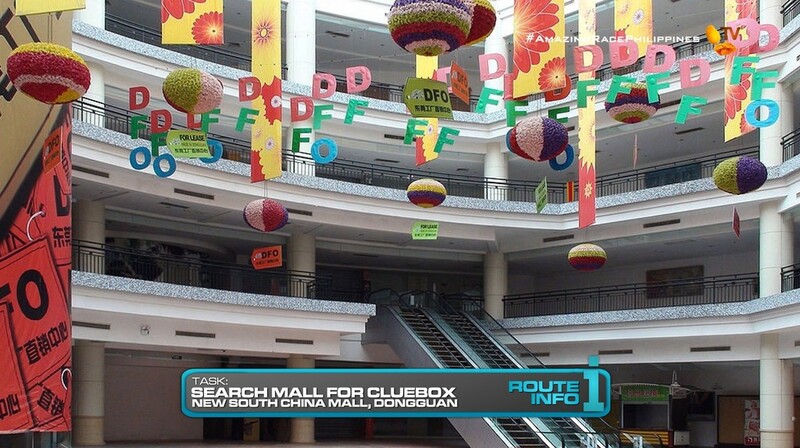 That clue directs teams to search the exterior of the New South China Mall, the largest mall in the world, for the next cluebox. 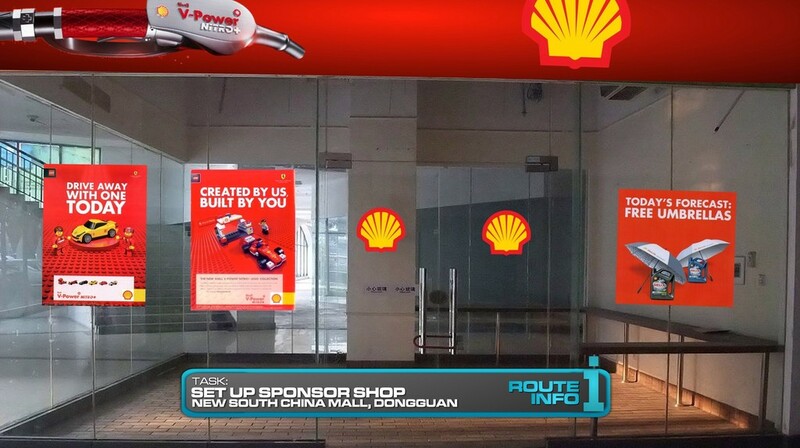 Once at the New South China Mall, teams must choose a number and find the open spot in the mall where they will set-up a new store for one of TARPH’s generous sponsors: Kia Motors, RCD Royale Homes, Shell, Nature Spring, Samsung, PLDT, Rexona or Smart. After they have cleaned up inside, plugged in light bulbs, decorated the storefronts and raised the store’s name, teams will receive their next clue. That clue tells teams to search the huge mall for their next clue. 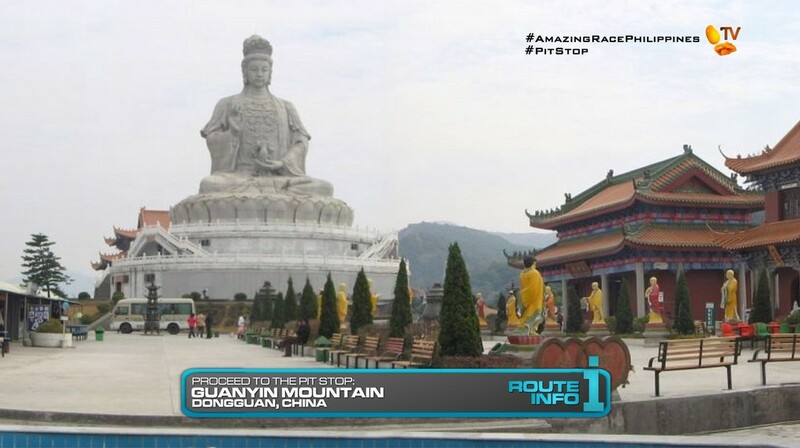 And the final clue directs teams to the Pit Stop at Guanyin Mountain. And the first TARPH All-Stars season is off and running! The Starting Line at Philippine Sports Stadium serves several purposes. First of all, it will be the first stadium Starting Line for TARPH so far after many foreign TARs have done the same numerous times. The ticket searching is just another Starting Line task. 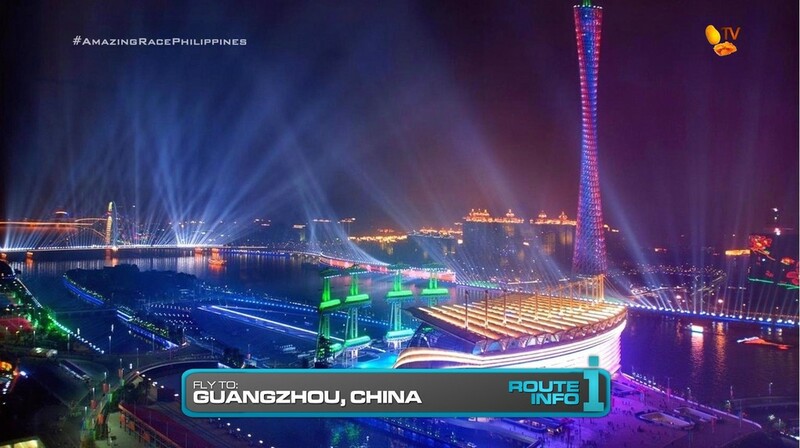 Also, the point will be made about Philippine Arena being the largest arena as they travel to the largest mall, New South China Mall. 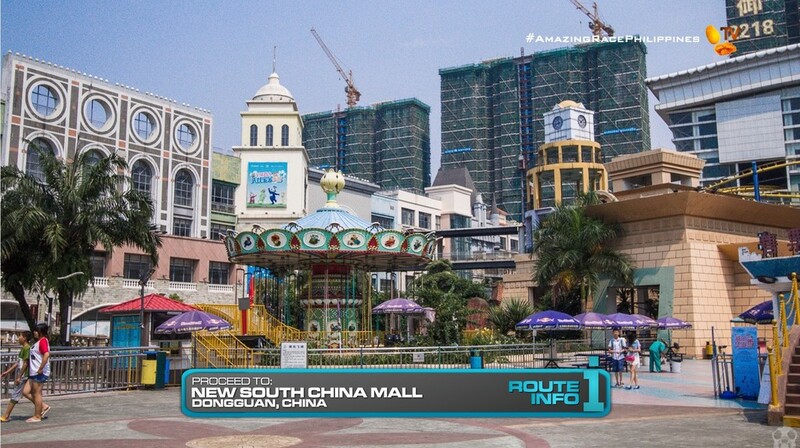 Ever since I heard about the New South China Mall and it being basically a hollow building with nothing in it as well as other ghost cities in China, I’ve wanted a TAR to visit such places. It should be fun and interesting. And especially in ghost cities, it would be very eerie and odd. To get to Dongguan though, this Leg must first have a stopover in Guangzhou. Again with my TAR24 task usage (lol), but the Road Block at Haixinsha Grandstand should provide the first Leg thrills with the high flying act. Walking to the Guangzhou Opera House, at night, should add some nice excitement, especially with the Roundabout. This Roundabout is simple. Teams get an Express Pass if they can repeat the Road Block. And the Super Yield is just another random twist that should help incite drama if all goes according to plan. And the task is simple enough that teams will want to attempt it. This is a pretty straightforward first Leg. The tasks overall may be a little underwhelming, I admit, but hopefully it is designed in a way that can still maximize possibilities of drama and competition. Especially in an All-Star season.